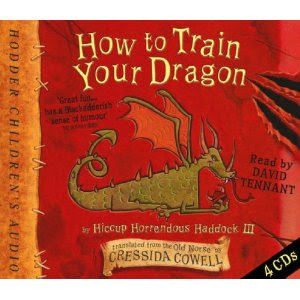 Most of our "reading time", this week, was taken up with listening to the audio version of Cressida Cowell's How to Train Your Dragon, in anticipation of the movie version, which came out this weekend. Though I have admit, after enjoying Cowell's entertaining story, which is nothing like the screenplay, in David Tennant's beautiful brogue, the movie seemed flat, and ordinary. That didn't stop the children from watching it twice in the same day (a school day at that). But, I'm glad I only paid a dollar to Redbox, instead of dropping a much larger sum, at the theater. Not that the movie is so bad - the book, as is usually the case, is so much better. I brought in the first three (written) books from Cowell's series, which the children have been tearing through, too. Judging from the speed my 13 year old is reading them, I'd say Amazon's reading level of 3rd-5th grade is correct for these books. The stories are surprisingly engaging. And, they are a good deal less crude, than I expected, given they are about young boys in a fictional Viking village. 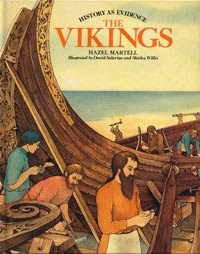 For some non-fictional facts, we turned to Hazel Martell's The Vikings, from the History as Evidence Series. It has a textbook quality to it, and again probably best for 3rd-5th graders, but the illustrations have kept my youngest quite captivated. And, we were all interested to learn, that Vikings did live in grass/sod roofed houses, but did not wear helmets with horns attached. Even so, I left the horns on for our movie time, flickr inspired, cupcakes. They wouldn't have been the same without them. Find out what others have been reading, at this week's What My Child is Reading blog-hop, hosted by Mouse Grows, Mouse Learns. It's great to be a homeshooler. Now you've got me wanting to get the books and read them. Okay, I wanted to before, but now I'm super curious. This might be a good follow up booking after reading about vikings from MTH. The viking cupcake adorable and you're right, it wouldn't be the same without the horns! Now I have to read the books!!! I love your viking cupcakes. We just watched the movie last night, from Redbox. Such great entertainment for $1! I will have to save these books for a later time. Love that cupcake! Cute cupcakes. We just saw the movie and while we liked it, I agree with you that the books are far better. Little J could barely the books down either. I admit that I know very little about Vikings despite several visits to Nordic countries. I didn't know that there is a book series behind the movie (which we didn't see and don't plan to at the moment). They look interesting for the future, and the cupcake just begs to be eaten. My son is begging for the movie (read the book already) The cupcakes are awesome! Might have to try that. Just yesterday a mom was telling me how much my kids would love the movie, and my first thought was..."is there a book"
off to the library website.